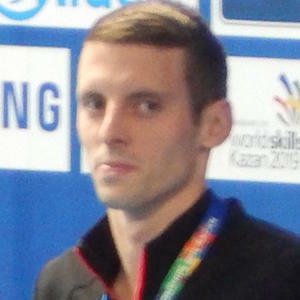 Long-distance swimmer who won four gold medals at the Commonwealth Games from 2010 to 2014. He was a silver medalist in the 1500 meter freestyle event representing Canada at the 2012 Olympic Games. He was born in Victoria, British Columbia and competed at the 2005 Canada Games at just sixteen years old. He set an Olympic record in the 1500 meter freestyle with a time of 14:40.84 in 2008. He has a twin brother named Devon. He and Grant Hackett are both multiple-time winners of them men's 1500 meter freestyle event at the Commonwealth Games.